First a quick update: My painting "Without Substance" was accepted into the Regional Juried Show in Newburyport. The show will be exhibiting May 6 thru June 4 at the Newburyport Art Association Gallery. Below is another painting of cupcakes in a glass dish that I completed last week. This is a red velvet cupcake with red velvet crumbles and a chocolate cupcake snuggled behind it. yummy! Speaking of yummy.....I bought an ice cream maker. I really like ice cream but I am not eating refined sugar. I have been experimenting with creating treats with honey or maple syrup instead of sugar. So far - so good. With summer arriving soon (hopefully) now it's time to take on ice cream. I'll let you know how it turns out. 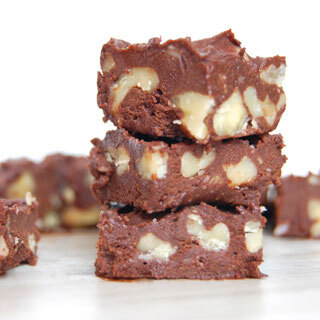 This is fudge from Paleo Grubs that I made that was very good. It's kind of a life saver when I crave sweet chocolate.